[INQ. NO. 1505M11] Based on more than 20 years of experience in cold forging, Sungsan Metals manufactures safety belts for automobiles, clamping parts for seats, bolts, nuts, rollers, by adopting a process method of cold forging. For automobiles, it can offer hexagonal bolts (M4~M20 to 250L), assembly bolts (flat washer, spring washer assembly), small screws, tapping screws, cold forged axles, and cold forged roller & special products. As special parts, it can produce parts for automobiles, motorcycles, automation parts for industry, parts for electric appliance fastening, and other special parts. 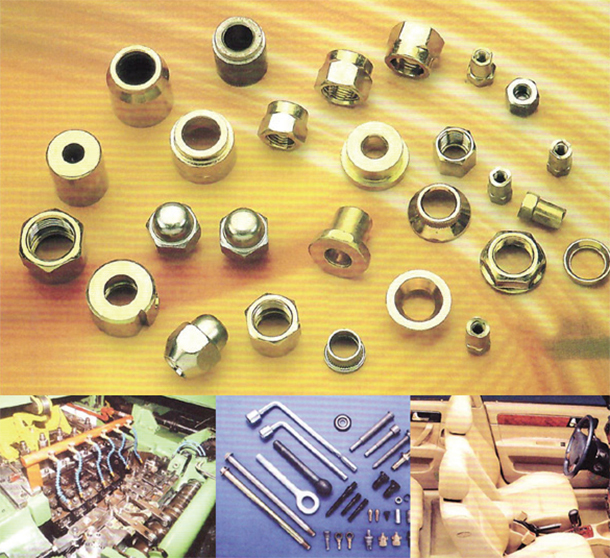 There are many kinds of well-designed machinery equipment for manufacturing of its advanced products, including parts former, nut former bolt former, header, rolling machine, tapping machine, and other facilities (assembly machine, high frequency heat treatment machine, other assisting facility and trimming machine). Sungsan Metals maker can offer products with very reasonable terms of contract in mass production. It will continue to strive for the highest level of customer satisfaction regarding high-grade quality.